DII nylon trapezoid storage containers are sold in a set of 2 identical containers and are available in four colors and five sizes to take care of your various storage needs. Bins are constructed with a metal frame with woven nylon material to hold up to any task. Storage containers are perfect for shelves, offices, laundry rooms, closets, and in your bedrooms for knick knacks, photos, or accessories. For care, simply wipe with a damp sponge to clean. DII has simple and effective storage solutions for any room in the home. Organize your kitchen or bathroom cabinets, the pantry closet, or office with these storage containers. These bins will help declutter your home in an instant with endless amounts of storage options including sizes that will fit seamlessly into any cube organizer. Available in five sizes: Small Basket – 12x10x8”, Medium Cube – 11x11x11”, Large Basket – 13x15x10”, Large Cube – 13x13x13”, and Tray – 13x15x5”. Tired of clutter in your office, craft room, or kid’s room? 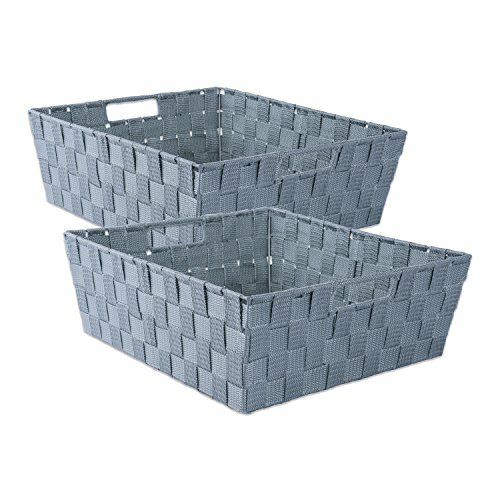 These metal framed woven nylon storage bins might work for you! Easily store office or craft supplies and organize the chaos in your cabinets by keeping all your things together. These bins are meant to be put to work and are strong and durable no matter where you need them. To view our entire selection of storage options search: DII Storage or visit our brand page by clicking the DII link at the top of the page. View More In Bathroom Storage & Organization. If you have any questions about this product by DII, contact us by completing and submitting the form below. If you are looking for a specif part number, please include it with your message. © 2019 - odnetworkli.org. All Rights Reserved.